A few tweaks to our Facebook "Share your Success Story" contest and we saw a 775% increase in Facebook likes in just 2 weeks! Plus, post views were up 500% and feedback 1000%. 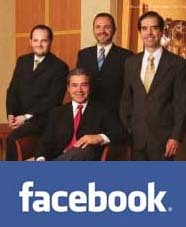 I launched a Facebook page for my longtime client CosMed Clinic last year. For most of the year, the page was an after-thought as we mainly focused on SEO efforts and other social media activities (such as participating on various weight loss and plastic surgery related message boards where our potential clients often researched doctors.) The Facebook page stayed at an even 200 likes for several months, with few comments. Most Facebook posts consisted of the same information that we just posted on our blog. However with the explosion of social media last year, paying more attention to the Facebook page and engaging with potential customers became a critical need, especially for something as controversial as plastic surgery in Mexico. As you can imagine, safety and trust are big issues when considering going to a foreign country for any type of medical care, so social media and real patient testimonials are crucial to helping new patients feel at ease and taking the next step to booking their appointments. No matter how informative the articles we posted to the Facebook page were, they were not creating the engagement needed. It was definitely a cold, one-way conversation. Then, we decided to launch a contest to increase awareness and engagement, plus gain a few great success stories from past clients. I used Wildfire App to launch a video contest, where past patients could win $1500 towards their next procedure for sharing a video testimonial. The results were pretty dismal. In the end, the problem came from taking people away from where they wanted to be (Facebook) and making them try to figure out how to upload a video to YouTube through the wildfire app contest platform. I underestimated the technical level of the audience and I became tech support rather than a marketer. A few months later I decided to try again – this time, I tried to make it as easy as possible for patients to share their photos and story – and to keep the interactions ON the platform they were already comfortable using. I sent an email blast to existing patients announcing the contest (same way I did previously, with same prize) only this time, because it was so easy, we immediately got success stories generating hundreds of likes and comments! The number of Facebook fans, which was at a stand-still for months, went up 775% in 2 weeks. Post views were up 500% and feedback 1000%. 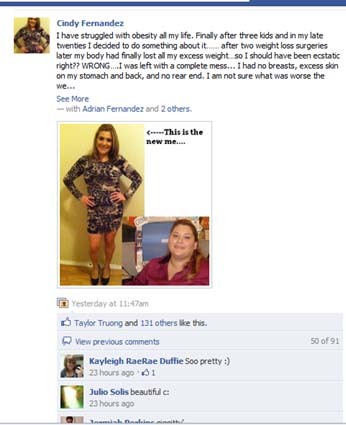 In addition to the new contest, I convinced the surgeons to start interacting with potential patients on Facebook. Now, potential patients could actually ask questions about surgeries and get responses from board certified plastic surgeons and a dermatologist. It added tremendous value to the Facebook page – and gave it a deeper, warmer level than an outside marketer alone could. In addition to the contest and “Ask the Doctor” feature, patient to patient interaction was encouraged. The results of these transparent conversations have been invaluable. As a result, patients are expressing how much more comfortable they are booking appointments after talking with doctors and patients on the Facebook page. The "Ask a Doctor" feature added tremendous value to the Facebook page – and gave it a deeper, warmer level than an outside marketer alone could. Interaction with real patients and seeing genuine success stories really made a difference in putting potential customers are ease. Now we get posts like this one, asking for support. In the case of CosMed Clinic, potential customers wanted two main things: the ability to interact with other patients and to be able to ask questions and get answers from board certified doctors in a medium they were most comfortable with. Take into consideration the technical level of your audience before you launch a contest in the social media space. Are they the type that would be able to easily create a video and upload it? Or would a simple text-based contest prove better results? Also, don’t take participants away from the medium (for example Facebook) that they feel most comfortable using. The more exposure your page gets, the more you need to check it – multiple times per day, especially if you allow others to post on your wall. You are not only checking for questions and concerns from potential clients, but also monitoring any spam that may appear. My last blog post “A look at social media contests in 2011: Lessons Learned (Part 1)” included a great interview further emphasizing the importance of this last point. Holly Berkley is the author of Marketing in the New Media and Low Budget Online Marketing for Small Business. Her newest book, Social Media in Action… will be available in early 2012. Holly has developed a 3-month corporate social media training program to help companies craft a social media presence that ties directly into existing initiatives or goals. Contact Holly Berkley to learn more about how she can help enhance your company’s social media outreach program. This entry was tagged facebook contest, how to increase facebook likes, increase facebook fans, internet marketing ideas, plastic surgery marketing, social media 2011, social media contest, social media for doctors, social media marketing. Bookmark the permalink. This is a great post that really explicitly breaks down how important it is to know your audience before launching any type of promotion or engagement initiative on Facebook. What do your customers want or need help with? In what way will you engage with them? Thanks for sharing the insight, Holly! Great read Holly! This post is truly insightful on how facebook marketing should help your business thrive with leads. I like the breakdown of really knowing and acknowledging your customer network and how crucial it is to participate with them and engage in actual time. You may learn about new marketing techniques, add your two cents in, or simply drop your link to your site! Keep up the good work! If you’re ever in need of any website assistance feel free to reach out!